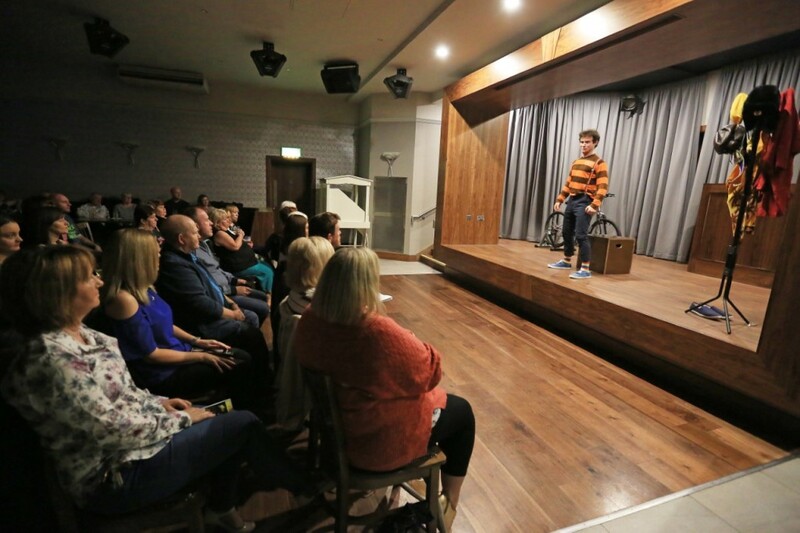 ROBIN Williams: The Laughter and the Tears will be coming to the Roddy McCorley club next week after sold-out shows in the Felons during the opening weekend of Féile. From the brilliant Tread the Boards comes Kieron Magee’s emotional rollercoaster ride through the life of one of the most loved stars from TV and the big screen. Starring John Travers as Robin Williams the play examines the highs and lows of Williams’ life including his addiction to cocaine and alcohol as well as his daily battle with depression. Charting his dramatic rise to the top of the Hollywood A-list, this is a no-holds barred account of Robin Williams’ life as he emerged from obscurity into the public glare of stardom. John brings the script to life through his rendition of the late comedian from the amazingly adapted vocal to the star’s frenzied performance. The 28-year-old from the New Lodge truly embodies the beloved comedian as he takes the audience on the rollercoaster ride documenting the career and personal life of the Oscar winning actor. “First of all getting the opportunity to play Robin Williams is a real honour as it would be for any actor but with the same breath a real challenge as you can imagine, with Robin’s endless energy, accents, comedic ability Oscar winning acting ability. After countless hours watching Williams’ movies, his stand-up and listening to Kieron’s endless research John slowly got a feel for the character. “Now with the finished product, after lots of time fine-tuning all the elements of the show, and having performed it to sold-out houses, Kieron and myself have been blown away by the reception. The audiences have been so supportive as they always are over the Féile and totally engaged with the show and came along for the ride, which has blown me away and shows me that hard work does pay off,” he added. English teacher and playwright Kieron Magee has gone from strength to strength since the performance of his first play ‘Blanketman’ in Féile 2008, around the time he first saw John perform. “I first saw John in a play a few years ago in which he also acted a monologue and he was just so confident as an actor performing alone on stage I thought the next play I have I have to get him into. Kieron explained that having grown up watching Mork and Mindy the sudden death of the actor opened his eyes to an ‘epidemic’ sweeping West Belfast. “At the time of his death a close friend committed suicide and I felt so sorry for families going through the motions in the aftermath, and decided it was something that needed to be highlighted,” he explained. “Suicide in Belfast, particularly West Belfast is an epidemic. People need to talk about their issues and seek help, but that help also needs to be far more than a short term fix. That’s why I choose to include his depression and the message for people to remove their mask and seek help. “The play is called The Laughter and the Tears, so expect to laugh and expect to cry as the comedy bursts onto the stage in the first act before descending into darkness in the second act.